"While we knew some of the details about the LG Panther (GW910), we didn't have all the little nitty-gritty bits. Granted, this is not the sexiest phone we've ever seen, but functional? Heck yeah, it seems like it'll do quite well with our new OS. The other thing is this is not final and LG might be apt to change or modify things before launch. Of note is the 720p video recording, something which is becoming more and more the norm these days." 5 MP Camera, AMOLED screen, and a Snapdragon. Nothing that's to surprising, and it's still with an expected drop date of Q4 2010. Interesting...... no info about storage space. Kind of a snoozer device...but then again, with the tight spec that Microsoft has laid out for Chassis 1 devices, they're all going to be fairly similar. ...but isn't that a WP7 screenshot??? 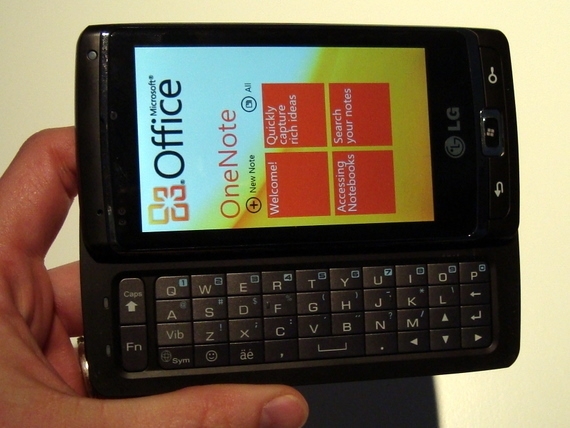 Which means that the OEMs have at least SOME version of WP7 in their hands??? Didn't I read something in the WP7 stuff about a minimum of 8G storage, with no SD card interface? Indeed, that's the minimum spec that has been reported. Correct - the OEMs have a beta I'm sure, for testing purposes. I don't think WP7 has gone code-complete yet...should be pretty soon though. You are correct and the lack of removable storage is the reason I found interesting that there is no mention of the actual capacity of the device.